Today is the first day of summer vacation for my children. I still have to work, of course, but they have lots of free time on the horizon. Today I left them asleep while I headed off to work, and I didn’t give them any directions for the day. It is the first day of their vacation, they should decompress, relax and enjoy it. Especially since things will be changing soon. Last summer, my kids spent so much time watching television, I had to prompt them to reply to anything I said. “I am really here in the room, not on TV entertaining you! Answer me! Have a conversation.” This year, I have vowed that things will be different. The TV will not be the primary form of passing the time. They will use their brains and their bodies for more than holding the couch down and watching other people far away do interesting things. The girl also needs to start thinking about a service project. She is entering high school in the fall, and she needs to start thinking about building her record for college applications. Plus, we need to do something to show her that the fact that I don’t buy her everything she wants as soon as she wants it does not mean she is disadvantaged, ;). I broke the news to the kids over brunch this past Sunday. They were not impressed. They became a little more enthusiastic when I said that they could choose their own goals (although I have to approve–they must be an actual stretch). So far, the girl has decided to learn to play golf with my dad, and the boy has decided to finish a story about dragons who live in the sewer system he is writing with his best friend. They are still thinking about the remaining goals. eryone has to participate. Also, to make this whole thing slightly more fun for them and less heartless, I bought the family pool passes. If they are at the pool, they are doing at least some moving around, and they won’t be watching TV. As for me, I am making a few goals as well. Writing: Establish a daily writing habit. I need to post more regularly here and at Gaming Angels. I am also working with a friend to start a crocheting blog for her new business. And I keep saying I write fiction, or at least I want to write fiction, but not doing any writing. It is time to change that. Oh, and here of course. Physical fitness: Since I got the FitBit, I definitely exercise more. I take more steps, and I am less sedentary. I could do better, though. For the past 30 days, my average number of steps is 5,612–not terrible, but I can definitely improve. I want to be consistently at 7,500 per day by the end of the summer. I know 10,000 is the usual goal, but I want to try to get there a bit more gradually; once I have mastered 7,500 consistently, I will raise the goal again. I also want to make sure my total active time for each day (lightly active, fairly active, very active) totals at least 4 hours every day, with at least 1 ½ hours in fairly or very active. Crafting: I am substituting this for science, since that is covered in the family goal, and I have a ton of crafting projects I want to do. For now, I will be relatively modest in my goals: 5 crochet projects and 5 non-crochet projectscompleted before school starts for the kids on 8/14. You may have noticed I didn’t put a reading goal in there; I am not sure what to do. I already read a lot, and I don’t have a lot of spare time to devote to reading more. All those goals up there will take a lot of my time spent not working, eating or sleeping! I am still thinking about this one. I haven’t made the kids finalize their goals yet, after all, why should I be done with mine? Do you do summer goals? Or is it all loose and easy at your house? Lately, all I want to do with my time is crochet things. This is an offshoot of my desire to create/build things in general, but I have been focused on crocheting in particular for many reasons. It makes me feel close to my grandmother, I am getting better and producing things I really like, and there are just so many things to make! So, last week, I made a quick and dirty menu plan and didn’t even get to post it. Then, I totally forgot I even had a plan. This week, I have to do better, :). Monday: I am picking something up from Crazy Bowls and Wraps. Tomorrow is the last day of school, the girl is behind on the dishes and wants to go swimming after school today, and it is payday. It is not the time for heroic cooking efforts! Tuesday: I will be working from home tomorrow, and only working a half day. So, even though it will still be a hectic day (the girl getting home from Six Flags at 5:00 and needing to be picked up, a big party at the boy’s school at 6:00), I can throw together something quickly. I usually don’t mind standing over the stove to make risotto-I sip some wine and get my zen on–but this Oven-Baked Leek and Bacon Risotto looks perfect for the last day of school. The kids love almost all risotto, but they will especially love it with bacon, and it will be easy for me to get in the oven before I go to pick up the girl, then we can eat before walking up to the party. Wednesday: Ah, the first day of summer vacation! I could ask the girl to cook, but I did tell her I would let her have one slothful day before I start giving her summer tasks. Peanut coconut chicken curry is not their favorite, but they don’t hate it, and I love it, so that is what I am doing. I don’t follow the linked recipe exactly (when do I ever? ), but it is a good base. I will use reduced fat coconut milk, less chicken, and add in chickpeas and veggies for a nice one dish meal, if you don’t count the rice as a dish. Thursday: I’m thinking this would be a good day to BBQ. Bratwurst, spicy mushrooms, slaw, grilled zucchini and yellow squash, mojitos, mint lemonade. I have a lot of mint in my garden, and I have not even begun to use it. Friday: The kids’ schedule has been up in the air lately, with their dad having a new job. If they are here, we’ll have pizza or leftovers. If they are not, almost certainly I will have leftovers. Saturday: Family is coming in from Ohio this weekend, and this is my night to host dinner. I want to do something fairly easy that uses stuff from my garden, so I think it will be chicken/veggie stew over rice with a side of Pickled Beets. Awhile back, I talked about my past struggles with crocheting, how I would try to jump in too quickly and get frustrated and quit. This time, I was determined, I would be kinder to myself, take things more slowly, and work my way up to the hard stuff. I am happy to report that this is working! I have actually made things that are not embarrassing to claim! I have completed three hats, and while the last hat is definitely the best looking one, the first two are not bad, if I do say so myself. I used this pattern, which is all single crochet stitches, and it did wonders for my confidence and getting into a good rhythm of stitching. I have also finished two scarves, because they are quick and easy. I can’t find a picture of my hats, but I do have pictures of the scarves. Both were made up patterns, just getting used to working with a slightly larger project and trying out yarns or threads I liked. 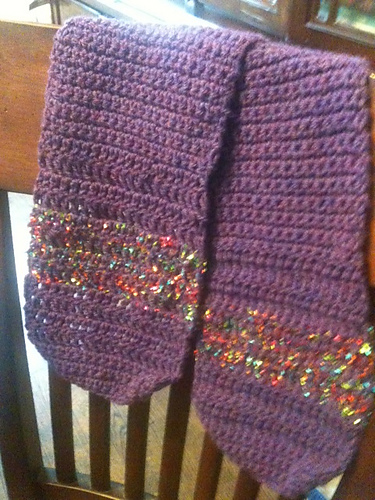 First, a jewel-toned scarf. I love variegated yarns, and I love jewel tones! This picture makes it look more blue and less purple than it looks in real life; I used my iPhone camera at work, so not the best lighting. Next, I bought a bunch of cool multi-colored thread from a local yarn shop, and I wasn’t sure what to do with it. 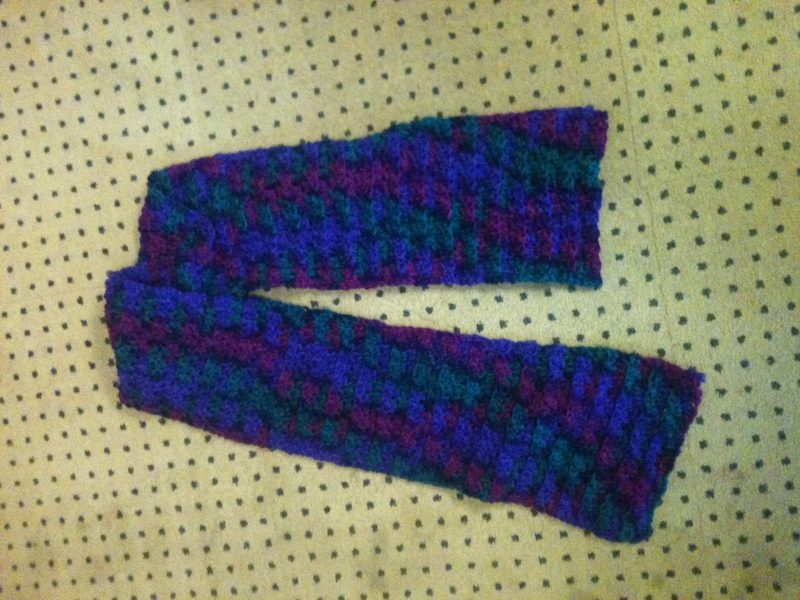 This is a scarf I made using it on the same hook with the purple yarn I used for the main part of the scarf. I love how it turned out, and my daughter, who was the recipient of this scarf, loved it, too. 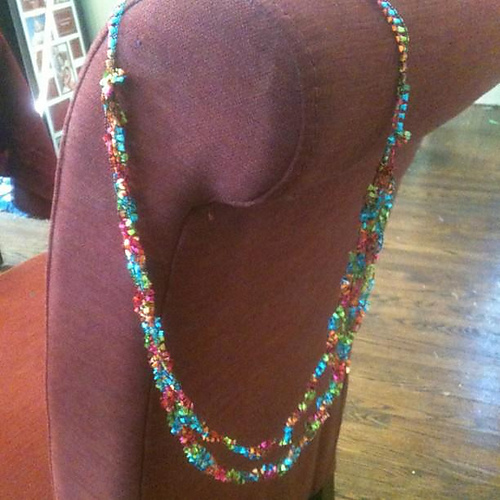 I also made a quick necklace with the thread, but it wasn’t terribly sturdy. I need to practice more on this idea. Beyond that, I have started many projects. I have even gotten pretty far on some of them. However, I haven’t really finished much. I have high hopes that I will have many finished projects soon, though. I have a few that are pretty close to being done, and I am trying to finish at least one thing before I start a new project. So far I haven’t had a lot of luck with that–I have 5 projects I am working on right now–but I am bound to finish something sometime, right? I am once again in a place where I need to be extra creative, because I need to make due with what we have in the house. I did go buy a few perishables this weekend, but end of school field trips, fees and I don’t even know what else are squeezing our budget. Fortunately, I have a lot of staples on hand, and I like being creative! Sunday: Fend for yourself – I made a big pan of Taco Lasagna Saturday night, so I wanted to get that eaten up. Unfortunately, the kids were not big fans of eating it two nights in a row, so only I ate it, and there is still a lot! They found other things to eat, though. Monday: Speedy Jambalaya – We did some cleaning this weekend, and I found an old copy of Taste of Home with this recipe. When I told the girl what we were having, she was very upset and said “That is not a real food, that is just a world people made up” with great disgust. She has a problem with new things. This isn’t even that strange–we eat other creole dishes, some of which she even likes! It turned out very good, though, and she didn’t hate it at least. Tuesday: Chicken in peanut coconut curry sauce, Red Lentil Dal – This is easy, cheap, and something the kids don’t appreciate as much as I do, so it is good for a night when they will be with their dad. Wednesday: Chinese meatballs with peas and pineapple over rice – I will make this with ground turkey instead of beef. Thursday: Beef stew – This will probably be more like what Rachael Ray calls a stoup–not quite as thick as a stew, but definitely not a soup.